If you missed them you can read part one here and part two here. 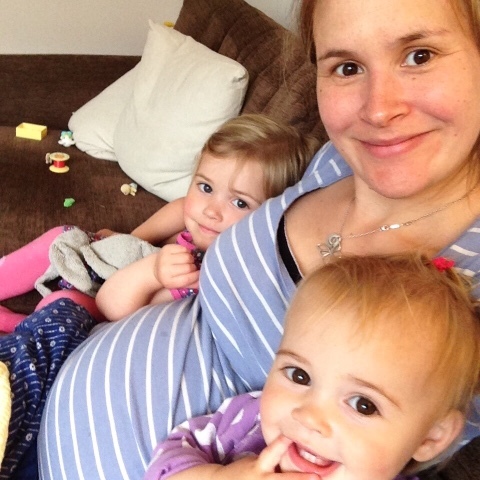 I found out I was pregnant with Lottie when Phoebe was just 11 months old and Ellie had just turned 3. I had been at work for the day in and went for a Christmas drink with my boss at the end of the day. Instead of celebrating the Christmas break with something sparkling and alcoholic I ordered an orange juice, the thought of anything else just felt wrong. Having had this feeling before I stopped and picked up a pregnancy test on the way home. We were due to go out with friends that evening for dinner and drinks, it was to be our first night out in 11 months... I was looking forward to a few glasses of wine. I thought I better just check if my instincts were right so quickly did the test. After it taking several months to fall pregnant with my first two I was not expecting any lines to appear on it after just one cycle. But then sure enough, two lines very quickly appeared and I burst into tears, with fear and panic at how would cope with three children 3 and under, with shock and with utter excitement that the third baby I so longed for was a reality and also that there would be no glasses of wine on our long awaited night out ;) I showed the test to Oli who was just as surprised but probably pleased that I'd be a cheap date on our night out. The pregnancy was very different, there was no sickness and I felt fine apart from being tired. I kept forgetting that I was pregnant but then also worrying that I felt ok. It took quite a while to sink in that I would have 3 under 4 when the baby was due. I was still breastfeeding Phoebe and wanted to do so for as long as possible as she had been very poorly with bronchiolitis and was barely eating. I had to stop 3 months into my pregnancy when she was finally well at 13 months old as I could barely walk up the stairs at the end of the day as I was so exhausted. I really felt that I needed to channel all my energy into growing the baby in my tummy. 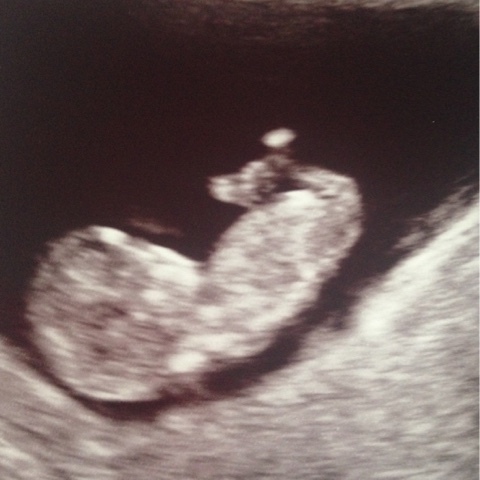 Seeing her at the 12 week scan was so reassuring and wonderful and I felt really excited to be adding to our family. Everyone was so convinced we were having a boy because there was no sickness like I had with the other two. At our 12 week scan the sonographer even remarked that she was 90% sure we were having a boy from looking at the baby's nub. It felt like strange unchartered territory and when I looked at boys baby clothes I just couldn't imagine having a boy, no matter how hard I tried. At our 20 week anomaly scan we decided that we would find out if we could whether the baby was a boy or a girl. Ellie was adamant she wanted a baby sister and I had so many boxes of girls clothing in the loft, it either needed to go or be brought down and washed! I was pretty certain they would be confirming that we would be having a son and was totally shocked but over the moon when they told us that we in fact had a third daughter on the way and I'd be a mum to three little ladies. 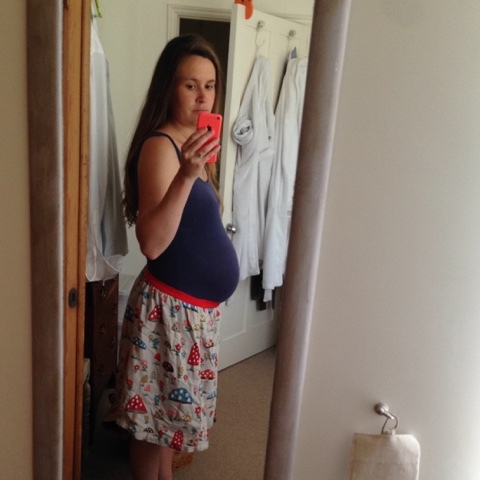 From about 37 weeks pregnant I was niggling frequently, the baby was very low and I was absolutely convinced that she was going to come early. 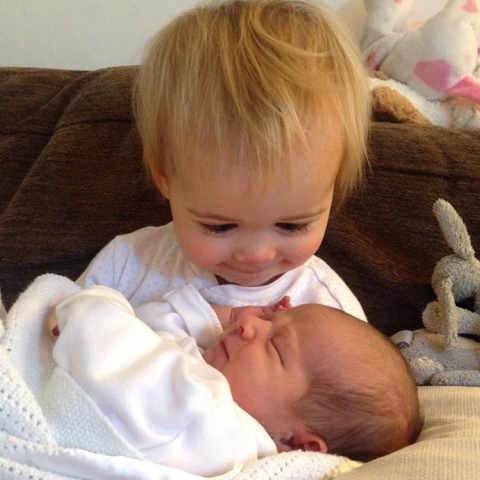 I was especially nervous as Oli works in London and I was worried about going into labour quickly as she was my third baby and once things got going with Phoebes' birth it all happened very fast. I was keen to try a hypnobirth this time round and read Mindful Hypnobirthing by Sophie Fletcher I downloaded the accompanying tracks and listened to them as much as I could before bed. I loved it and it really helped relax me. 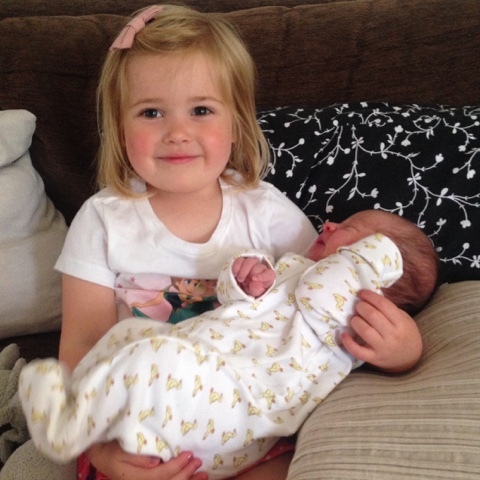 The week Lottie was born I felt I had so many false starts and had even called my husband home from work as I was sure she was on her way. After a few hours it all tailed off each time and I was becoming increasingly frustrated and was very ready for her to come. At my midwife appointment on Friday (Lottie arrived in the early hours of Sunday morning) I asked for her to examine me and was 2cm and in very early labour, she gave me a good sweep to help me on my way. I started having irregular contractions but couldn't relax as I had Ellie and Phoebe to look after. I tried a very long walk that evening and bounced on my ball but the contractions were still very sporadic and I was exhausted. They did wake me around 2am and I couldn't sleep so I went downstairs and swept the entire house with a dustpan and brush and washed all the floors that could be washed with antibacterial wipe, it was an overwhelming urge and if you're wondering the dustpan and brush was very effective! About 6am I went back to bed as I was tired from all the cleaning and the contractions. Looking back this seems crazy. It was an unbelievably hot day and the girls spent most of it in the paddling pool. My contractions were coming every 20-30 minutes all day but were very intense, I felt like they were as powerful as they were in the hour before my other two arrived. I got in the bath even though it was hot to try and relax and make myself more comfortable but our bathroom is downstairs and the girls kept coming in and interrupting me and drinking my water and I just couldn't concentrate. I tried going to bed to sleep and listen to my hypnobirthing CD but felt really restless. My mum was extremely ill with a nasty virus and my sisters were working and at a wedding, my Mr's parents were on holiday as was my sister in law so the girls had to be at home with us. I think being in 'mother mode' really slowed things down because as soon as we put them to bed around 7pm and I was able to focus things really ramped up. The contractions although 15-20 minutes apart were very strong and I couldn't talk through them or stand. We called the hospital and they said I was welcome to come in but to be prepared that I might be sent home as they really needed to be 5 minutes apart. Instinct told me otherwise and after calling my poorly mum we headed to the hospital about 9pm. I was very calm by this point and felt in control, when we arrived at the hospital I think they assumed from looking and talking to me that I was in early labour. About an hour after we arrived they examined me and were very surprised that I was 8cm. I was finally given some gas and air as they filled the pool, I love that stuff, it is amazing! I remember looking at the clock and thinking that we would have our little girl by midnight, I was almost right. The familiarity of the birth pool was wonderful, I felt safe and warm and in the zone. I knew what I was doing and that I could do it. Our midwife was wonderful and I remember chatting to her in between contractions about our wedding, our girls etc My waters went about 20 minutes before she was born and then I felt the urge to push. I was so worried about tearing as I had with my previous births and really took my time with controlled pushing just letting her head make its way down the birth canal as calmly as I could. 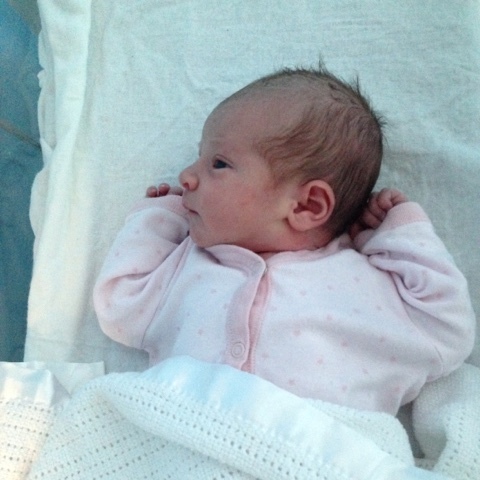 At 00:56am on Sunday 23rd August our perfect little Lottie arrived weighing 6lb 13oz, I couldn't believe that she was finally here, born in the very same birth pool as her two big sisters which was really special. My controlled pushing really paid off and I was so happy not to need any stitches this time. It really made the recovery easier with two other little ones to care for. I had never stayed in hospital overnight before with my other two births but with it being the middle of the night I went to the post natal ward with her while Oli went home to be with her big sisters. I didn't sleep that night, I just held her and fed her and looked at her and cherished that quiet, peaceful time just her and I.
Oli came to collect us mid morning and after all our neonatal checks we headed home to introduce her to her eagerly awaiting big sisters. When we walked through the door of my parents house Ellie came running to the door having been waiting at the window for us to arrive. I crouched down to give her a cuddle and she ran straight past me to the car seat and said "is that my baby sister mummy? thank you so much for her". My heart hurt with love as they spent the next hour taking turns to cuddle her. Phoebe was mesmerised with her and at only 18 months old there was no jealously just love. 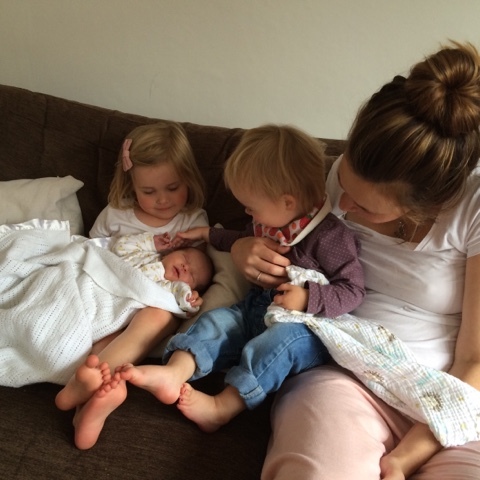 As overwhelming as it suddenly felt to have more children that hands, I adored seeing my three girls altogether for the first time, it felt amazing, it felt complete. If you enjoyed this you might like to read my post: "When the puzzle is complete".